By utilizing an l-serine-derived bicyclic lactone as an advanced chiral building block, a short synthetic route to the cytotoxic marine natural product jaspine B has been developed. 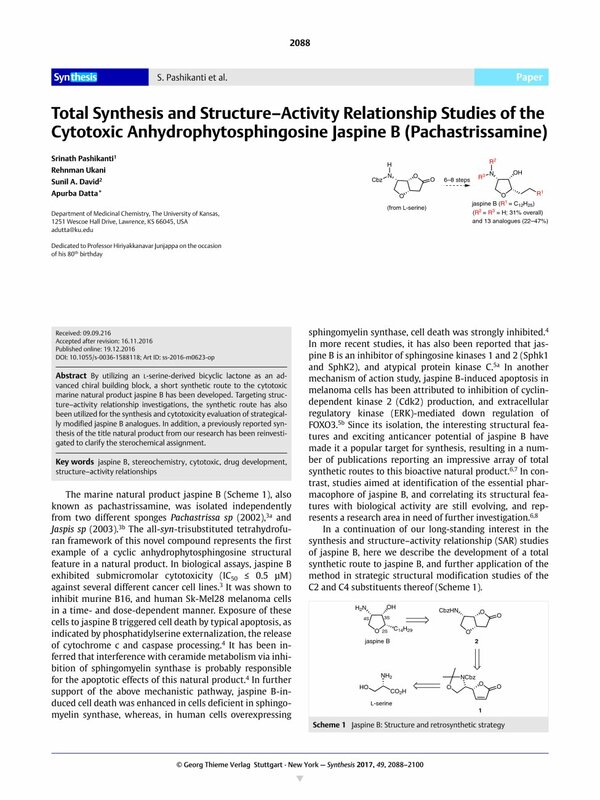 Targeting structure–activity relationship investigations, the synthetic route has also been utilized for the synthesis and cytotoxicity evaluation of strategically modified jaspine B analogues. In addition, a previously reported synthesis of the title natural product from our research has been reinvestigated to clarify the sterochemical assignment. Supporting information for this article is available online at http://dx.doi.org/10.1055/s-0036-1588118. 1 Present address: Department of Biomedical and Pharmaceutical Sciences, College of Pharmacy, Idaho State University, Pocatello, Idaho 83209, USA. 2 Present address: Department of Medicinal Chemistry, University of Minnesota, Minneapolis, Minnesota 55455, USA. 8i See also ref. 7o. 16 All the CLogP values listed were obtained by using the ChemDraw software (version 15.1.0.144).